Note: The included testimonials are of an historic nature and do not include current service or restricted information and may have been edited of personal or non-related subject material. Bill joined the Armed Forces in 1937 initially with the New Zealand territorial forces First Otago Regiment. When the second Scots were formed Bill transferred to them and was later selected to join the Independent Company. When the New Zealand government decided not to send any soldiers under the age of 21 to serve in the army overseas Bill joined the air force. Bill trained in New Zealand and then Canada, learning to fly on what was then known as secret aircraft. In all there were 14 including Bill preparing to be navigator wireless operators on the secret aircraft that turned out to be the Mosquitoes. Bill completed his course and finished up as a wireless operator air gunner. From Canada Bill went to the United Kingdom. Bill's service in the United Kingdom saw him finish up on 626 Squadron Number One Group Bomber Command. 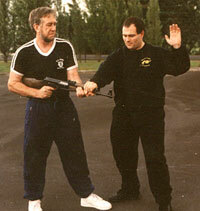 It was during Bill's training phase in the United Kingdom that he underwent unarmed combat training. 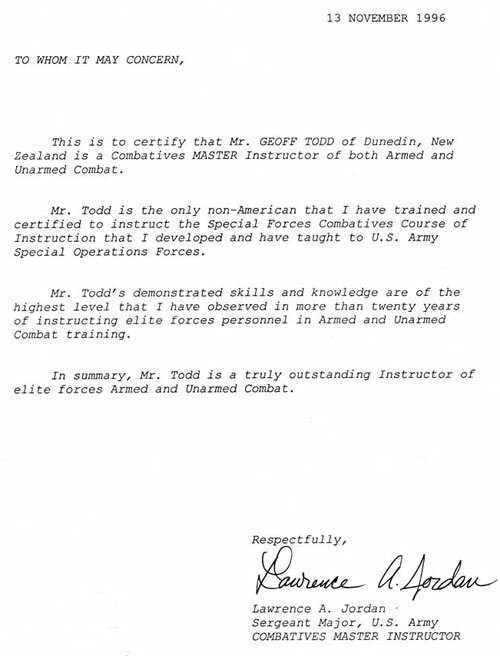 He had already undergone basic unarmed combat training with the Independent Force prior to leaving New Zealand. Bomber command suffered the biggest and most horrific casualties of World War II. 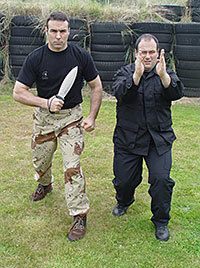 Unarmed combat was a vital part of their survival if shot down in enemy territory. Bill was part of the air crew in the Manna operations, flying at extreme low levels dropping supplies to the starving Dutch. Special Forces Combatives Master Instructor, US Special Forces, US Rangers, International Close Combat Instructors Assoc. 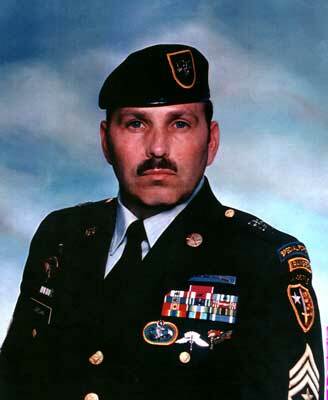 Served in the 82nd Airborne and Special Forces for 14 years, trained in Heavy and Light weapons, Intel, Operations, HALO, Tactical Special Forces SCUBA, Team SGT. Special Atomic Demolitions (SADM) and related Special Forces training. 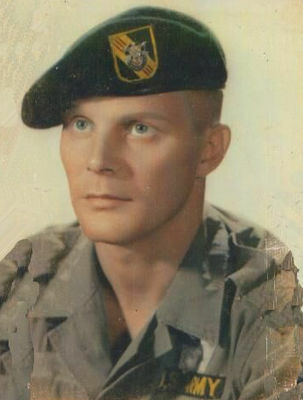 A retired Viet Nam Veteran where he served with Det. A-219 (Mike Force and Eagle Flight). He was selected to represent Special Forces on a special international demonstration team. In the third special forces group he instructed hand-to-hand combat to an A company and while serving in Mike Force Vietnam Ken, Truman Foy and Jim Fiquette were sent to The 25 Infantry Division to instruct hand-to-hand combat for 10 days. 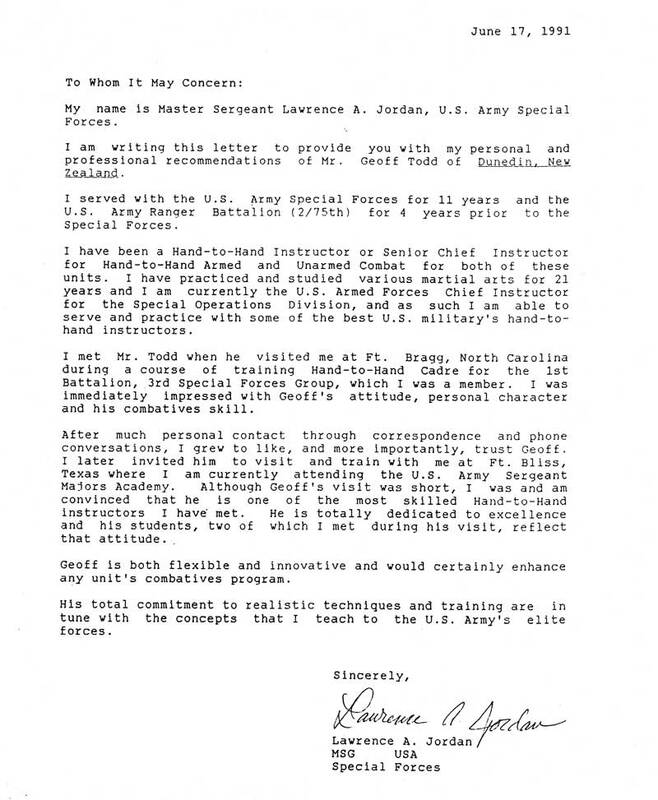 While with the SADM detachment he began teaching his team hand-to-hand combat and when other teams heard and made requests for this training he also trained them. 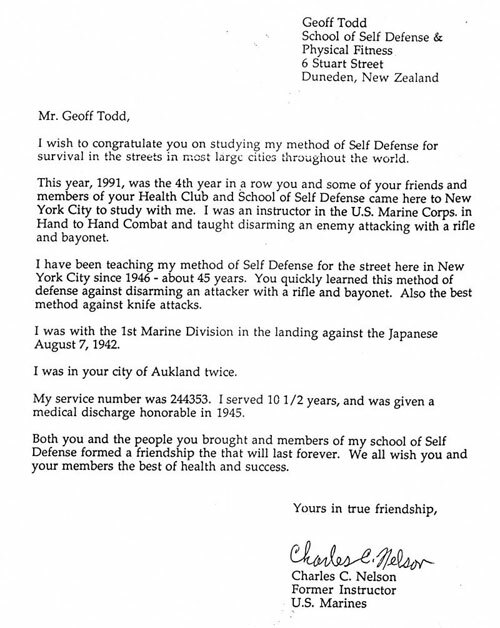 In recent years he has become involved in hand-to-hand combat training again in Southeast Asia with other former US serviceman and the Thai military. 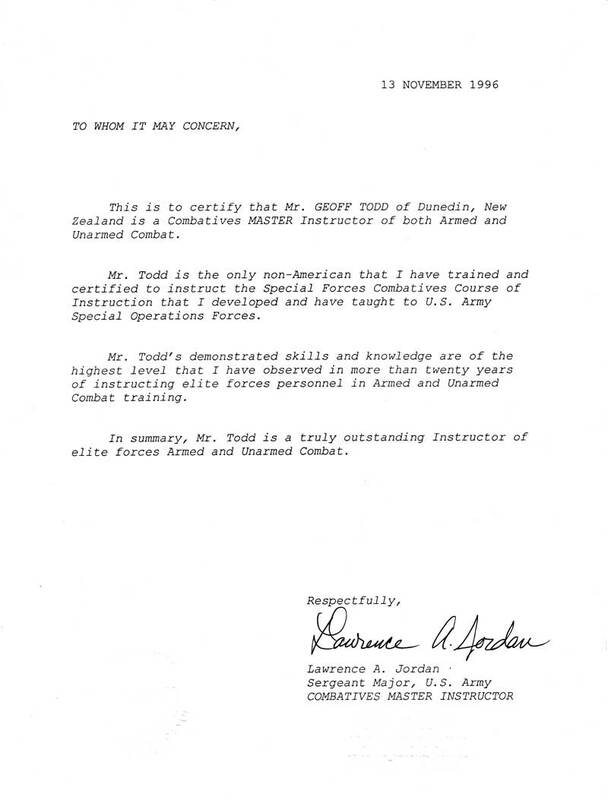 I would like to make a few comments on the Todd Group and Tank Todd. 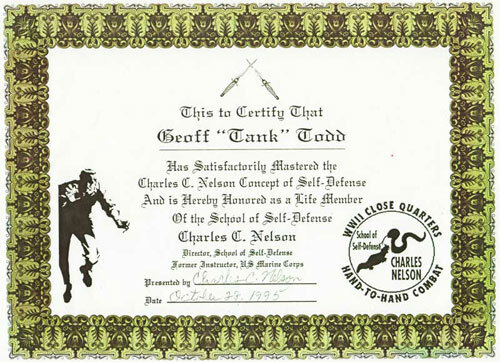 First of all Tank is the most professional instructor in CQC that I have ever worked with. His tireless instructing and his communication skills leave nothing to be misunderstood. Having worked with Tank for the last 2 plus years I find him to be spot on regarding his planning for the courses in Lop Buri. Tank’s ability as a leader both on and off the course is exceptional, and not usually found outside of the SOF community. Tank’s no nonsense planning and fulfillment of promises made to the students and staff leaves no doubt as to what must be done and by whom. The respect shown for Tank is clearly evident in the way the students perform. On a personal note I look forward to working with Tank for many more courses here in Thailand. As the Director of Operations, Ranger Training Group, Lop Buri, Thailand, I highly recommend his Todd Group to anyone seeking to be a more complete individual both mentally and physically. My name is Kobus Huisamen. 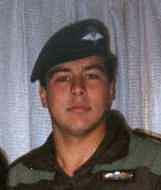 I'm a former paratrooper in the South African Defence Force and I've also made a living as a security officer and professional fighter. 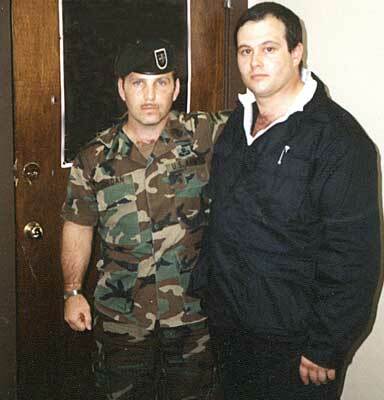 My service in the Parabats saw me do urban COIN duty in 1990-1991. I ran my own business in my student days and did mostly bouncing and venue security. This, I did for 9 years on and off. I fought professionally as kickboxer and MMA fighter and was South African Heavyweight champion; competed in Asia, beating Japanese and Korean champions. My record in kickboxing is 7 fights 7 wins, 5KO; and MMA 1 win, 4 losses, 1 KO. I also coached and seconded K-1 and Pride fighters. In my life, I saw confrontations of all sorts, spilling into violence of all sorts. With God's protection, I was never hurt and never lost a fight in the street or bar. I trained for 3-5 hours every day while I fought and bounced. 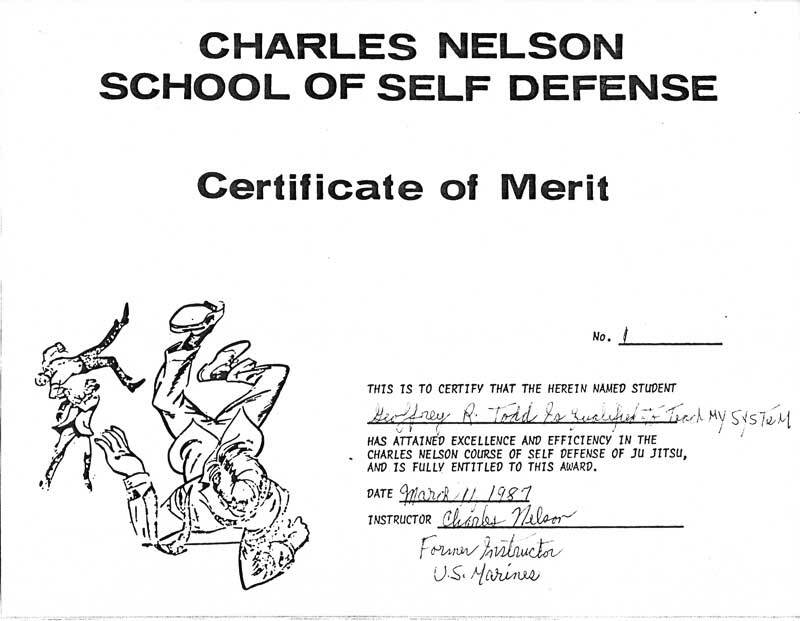 In 2004, I was looking for something different and earnestly looked for something that would let me train less, but be effective not only for me against multiple assailants, but also something that I can teach my family and be effective for them also. 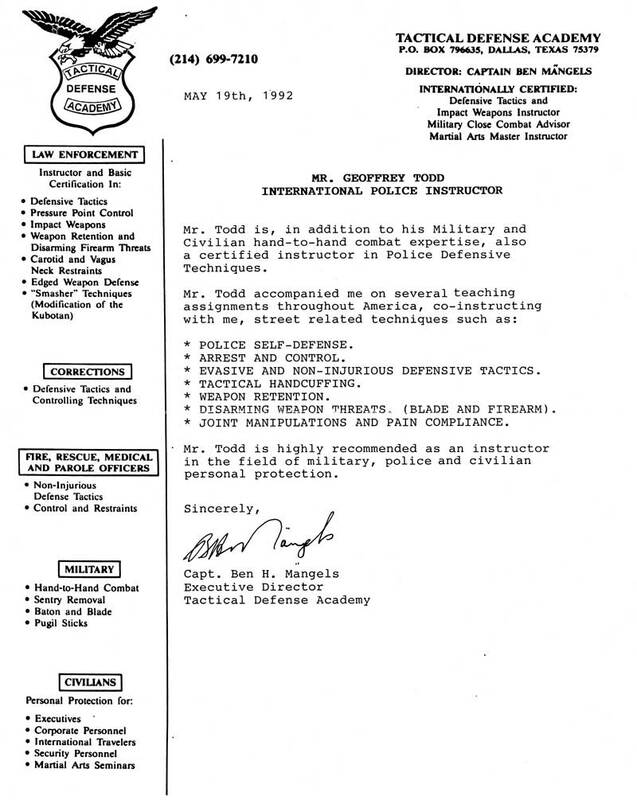 I stumbled upon the Todd System, lead by Geoff (Tank) Todd, a trainer of elite military units, private military contractors, security officers and selected members of the public. 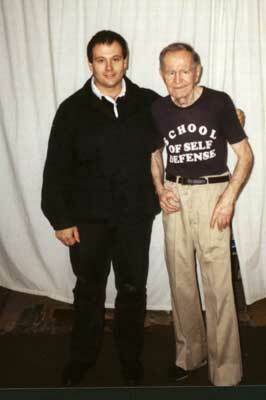 In 2005, I trained with him and was totally shocked at the brutality and simplicity of his system. I never saw something like this in either the military or meanest night clubs. It is a fierce system and depending on the force at which you apply, can either be a peacemaker or killer. Again, the great surprise was its simplicity. It efficiency was evident. This system gave me the peace of mind I was looking for. I can apply these techniques well into my old age; since it does not require the kind of physical conditioning that I was subjecting my body to at that time. I love the system and respect it. 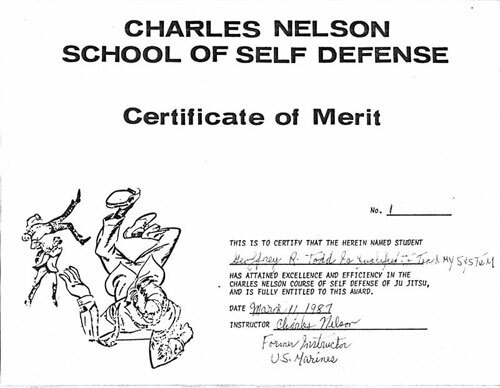 It made me even more efficient in a threatening situation than when I was as a professional fighter. Of course, I would only speak for myself, regardless of the competent military and private contractors that he trains, one can only speak for oneself. Furthermore, my time spent in Dunedin was a great experience. I walked away with not only a deep respect for Tank and his group, but also a new-found love for New Zealand and its people. They are like Todd's fighting system – a no-nonsense-and-straight-to-the-point bunch. 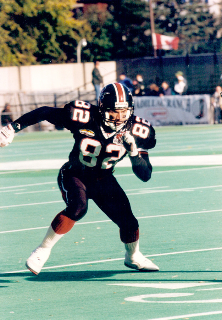 Will Hinchcliff was a professional Footballer, NFL & CFL Wide Reciever, for L.A. Raiders, Washington Redskins, and B.C. Lions. He is a top track and field star in New Zealand. He represented New Zealand in the 1990 Commonwealth Games, competed in both Winter and Summer World Championships, and competed in 100 meters, long jump and bobsled. He is a mechanical engineer by trade. John is CEO for Primary Heart Care, the first company in New Zealand to offer the only non-invasive way to over come Heart Disease offering FDA-approved EECP®, enhanced external counter-pulsation therapy. Will was a top 10 percenter on the annual international combative course and test phase at the Todd Group headquarters 2008. Personally I would thank you for your time and effort in making it possible for me to participate in you 1st Phase program. I am truly greatful for the positive outcome I have received after completing your 1st Phase Course. 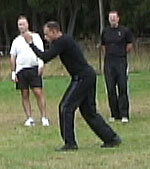 It was a real opportunity to test myself against other worthy exponents using your Self defense combat system. I could not have achieved this without your expertise. 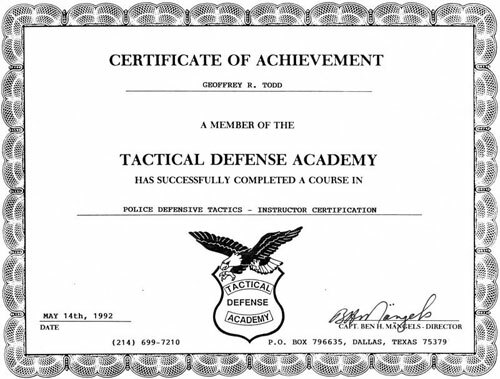 I have not been through any other self defense program, so I really appreciate learning the skills and CQB principles during my 1st Phase course training. I am much better for the experience. I feel I have accomplished a lot and now I have a whole new level of awareness. I look forward to being a positive role model as part of your organization as an exponent and in my capacity as a Company Director. I would also like to say that your instructors helped make the course as enjoyable as possible. Everything ran smoothly and your instructors clearly demonstrated what was expected of us throughout the course. I thank all your instructors, for their time, effort and coaching over the week. Last but not least I would like to say, thanks to your wife and daughter and their team for preparing our meals like clockwork. They catered for everyone's needs very well. 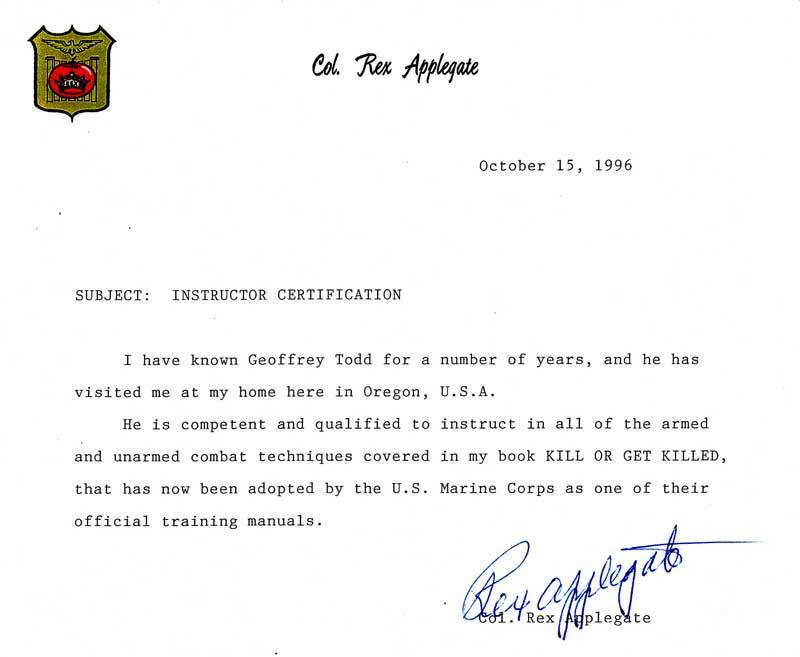 Much has been written and said about the military CQB practiced and promoted by Geoff Todd, but what of the man behind it all. I could say all the usual things but what weight would they carry just on their own with nothing to support them? I would like to illustrate what the man behind the practice is really like. I first met Geoff around 1989. My wife and I were venturing overseas and we both needed upskilling (for me) and basics (for my wife). After some one-on-one tuition I realised that although I had undergone CQB training in the Army many years before much of what Geoff had to impart was quite different to and in many ways safer and more efficient than what I knew. He basically had to re-programme me! During the course of these lessons, Geoff found that I had previously served in a special operations group and expressed his desire to be able to one day demonstrate his abilities to and eventually be accepted to the Military Elite. For Geoff to get there was not easy. 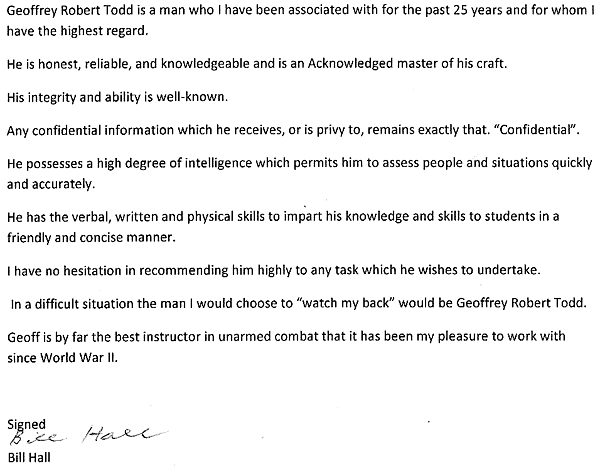 After completing his self defence course I continued to attend his CQB club nights and during the ensuing months I decided to put his name forward for consideration. Little did he know he had been under going scrutiny and my own personal selection criteria for a some time (we laugh about it now). I watched, listened and spoke with others until I was certain that Geoff the person was in my view suitable to be introduced. Geoff never rested on his laurels always researching and developing more efficient and innovative techniques. 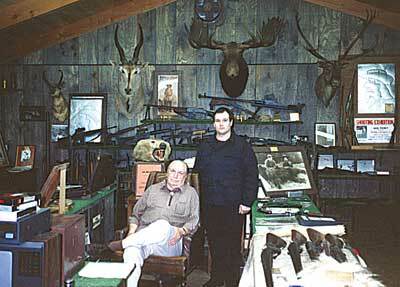 His own self discipline and that of his students was paramount. Geoff treated everybody equally-with respect. No matter how good he was at his craft, and he was really good, he was quietly confident and never boastful. 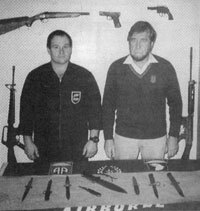 Eventually I contacted an old friend and ex-colleague who was still serving and, because he was in a position of authority, invited me to present Geoff for an introduction and eventually a demonstration. As an aside, never volunteer to partner Geoff in a demonstration when he is trying to impress someone; the effects are felt for days! Following this, further scrutiny took place and both Geoff the person and Geoff the instructor were invited to be part of the training process. This is Geoff the person, a man humble by nature, a man whose integrity to himself and others is unflinching and unquestionable. This is the man I know and stand by. His craft? 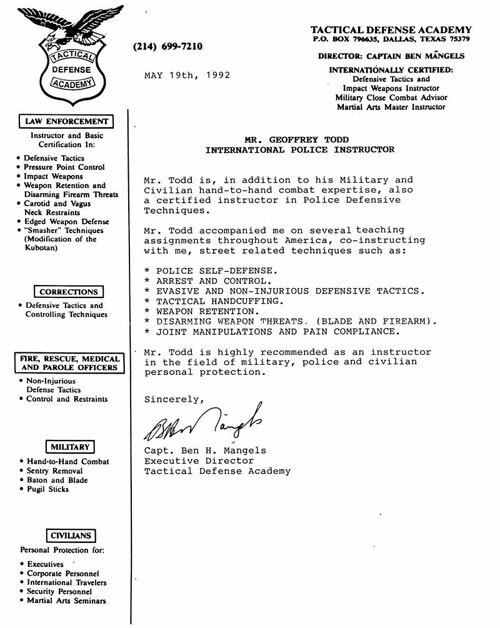 That his CQB is accepted at all levels of the Military speaks for itself. 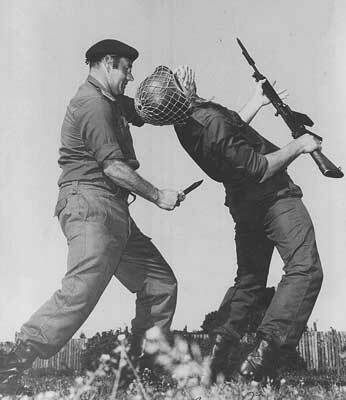 Introduction to unarmed combat during national service,1956-1957. Post national service, Grahame served in the territorial forces until the territorials were stopped. Started unarmed combat training at the Baldock Institute under Harry Baldock, 1958. 1970, joined the Tommy Bolton unarmed combat school and was a senior member. In his capacity as a pharmacist he serviced the nutritional and sports medical requirements of fighters for 40 years. 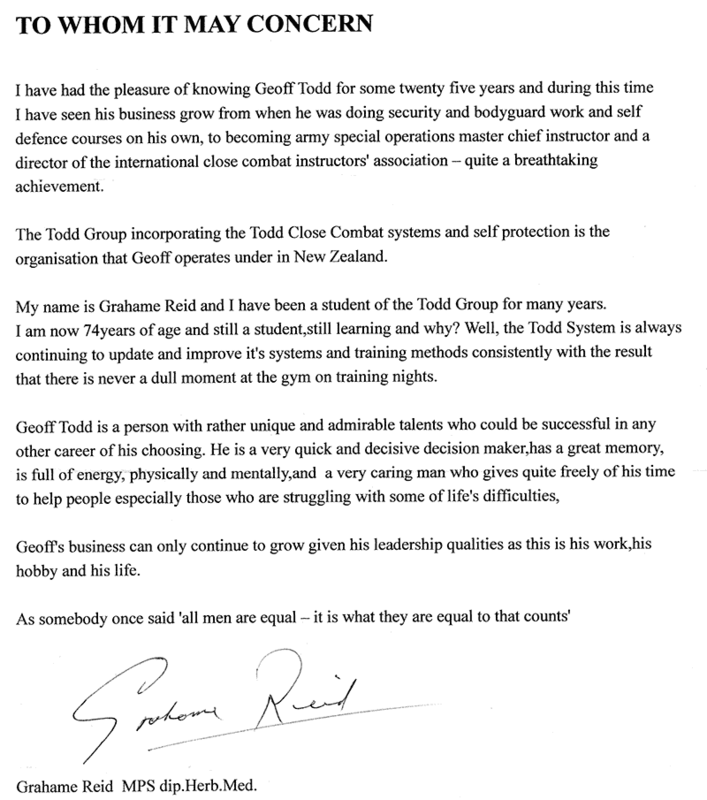 Grahame has been a member of the Todd Group for the past 25 years.